All Zerto Shredded cheese is guaranteed to be 100% pure cheese with absolutely no preservatives. Each cheese is freshly shredded and immediately placed into sealed deli cups for maximum freshness and shelf life. 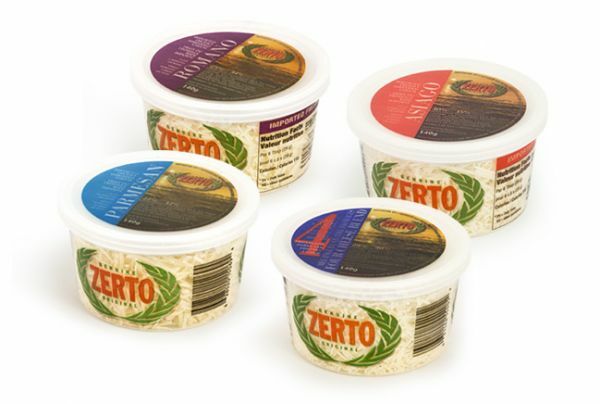 The Zerto shredded cheese, with its superior flavour and melting ability are the finest shredded cheeses around. Zerto shredded cheeses are perfect for a wide variety of uses: traditional pasta dishes, omelets, salads, sauces, pizza, burgers, chilli, soups and baking applications. Use your imagination and create your own fabulous new recipe as the uses are endless. All products once opened are to be kept refrigerated and all five varities are packed 12 x 140 grams.